Eat,sleep,and breathe hockey. I don't post often anymore but read the board regularly. Woo Hoo! How sweet it is! Take that OV you classless goon! Win or lose tonight I have no doubt our “bunch of jerks” will leave it all on the ice. This team has played their guts out to get here. I don’t want this stress filled playoff run to end tonight. Let’s go Canes! This one was ugly but we get another crack at them in OUR house. We are seriously out manned with all the injuries but I think we can expect a better game. IMO Mrazik still deserves the net. I got so sick of them whining about Oshie! Win or lose I’m proud of our teams effort in this series. Buckle up Canes and get us a road win! Glad to see Avalanche knock out the Flames. 😀 Boston could be out tomorrow. What a great win! I was a nervous wreck while we were clinging to 1 goal lead. IMO Foegle does not deserve a suspension but we have been messed over before. These reactionary penalty calls because Cap players are down are wrong. I just hope the league gets it right this time. More of the same in your face all over the ice hockey please. 😬 I expect caps will push harder but so will we. 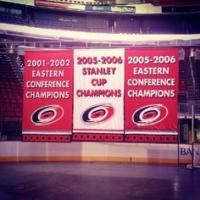 Caniacs will bring it again tonight and be even louder. Go Canes! IMO we sit Ferland. He has started and left too many games lately. Would rather have a Checker called up who might play a whole game. Yeah baby! Flushing those Craps feels good! Those DC fans next to the glass didn’t look too happy. We never let up and took it too them. Keep the pedal down but be smart! Let’s go Canes! We need a win tonight! It was nice seeing Pens lose. Jack Johnson was terrible. Now they probably see why he was scratched by BJs last year in playoffs.